Costa Rica is known for its vast rainforests and the animals and fauna that come with that. The house we're in is surrounded by rainforest. The house is on a 5 acre lot and two acres are landscaped and maintained. We see toucans, parrots and toads daily. I'm not a fan of the toads. Not. At. All. They creep me out. Every night we turn on the lights on the outside of the house. It illuminates the outside walls along a covered walkway that connects the bedrooms to the kitchen and an outside bathroom. The light attracts bugs (grasshoppers, praying mantis, beetles), and this attracts the toads. When I'm walking past them, I never know which direction they'll jump. This freaks me out because I fear they will jump into my path...then, I'll step on them...And then i'll feel their skin and squishy bodies under my feet...None of this is a reasonable fear, but, none-the-less, it exists. Here is one of the toads that had a party on our patio every night. This was a favorite resting spot of the toads. It's the dog's water dish. It (along with these toads) has since been relocated. Each night 1-2 toads would sit in this pot and poop. The toads don't like us either. They jump away when they hear or see us. The little ones aren't too smart. They jump into the wall over and over again when we pass. None of this is bad compared to the toad poop. We wake up every morning with big huge toad turds all over the front sitting area and in the main walking paths of the house. After one and two nights, we can still navigate the poops. After three nights, it's unbearable. We're constantly hosing off and sweeping the tile deck. After some research, we learned that these toads are from the Bufo family. On the positive side, they eat bugs but that's their only redeeming quality. They can be harmful if the dog licks them, which she doesn't. Also, their excretions contain a virus that isn't good for humans to ingest. I started wearing flip flops instead of going barefoot. I started washing the tiles daily, instead of just sweeping off their feces. How do we get rid of the toads? A local friend recommend a liquid solution called carbolina. We bought it and poured it around the perimeter. It did nothing to deter the toads. It is the rainy season so it's possible the carbolina was washed away quickly. This is not a bad thing since it did not smell very good. Plan B. We decided to relocate Toad Alley. On the first night, Ken caught and trapped six toads. In the morning, we put the toads into a bucket (with a lid) and the boys released them a mile away at a nearby stream. Step 1: Capture toads at night. Step 2: Place frogs in big pot to wait until the morning. Step 3: Wash hands thoroughly. 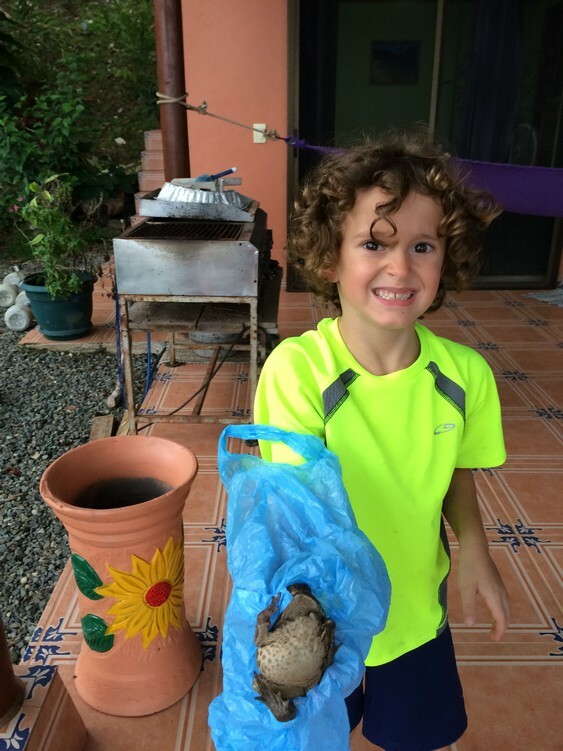 Step 4: In the morning, transfer toads to a plastic bucket (or plastic baggie or whatever works). Step 5: Drive or run to a toad relocation spot. Here, Tag is in charge of making sure they don't escape the bucket. When Ela helped Ken with morning relocation, he had them in a plastic grocery bag. They jumped and made all kinds of commotion. Ela was freaked out and refused to hold them any longer. Ken rolled down the car window, put the baggie in the window, rolled up the window and let them hang until he arrived at the relocation spot. Tag, who was in charge of keeping the lid on the bucket, kept teasing Ken that he was going to release the toads in the car. He knew that would really bother me! Whew! Toads gone. Would they come back? It would be a mile journey, much of it on a steep uphill for them to return. Wouldn't they prefer the fresh stream in their new home? On night two, Tag announced that there were two more toads. Ken trapped and released them the next day. We relocated one toad each on nights three and four. Finally, nights five and six were toad free! After night three, Tag decided he was brave enough to pick up a toad. However, he wasn't brave enough to touch it without a plastic bag on his hands! On night seven, three BIG toads arrived. Ken trapped the first and an hour later it escaped. It actually jumped out of our trap, which no other toad had done. He re-caught it. While doing so he also spotted and caught two others. He released them all the following day. In seven days our catch and release program has relocated 13 toads. While we can't say with full certainty, we're pretty sure we've not moved the same toad twice. The patio is currently toad poop free and this make me very happy. We don't know how long this will last. It's possible we (Ken really, I can't bring myself to touch them) will be relocating toads for the remainder of our stay here. However, the effort it takes to relocate the toads is less than it takes to clean off their excrement every morning. If you have any other ideas for us, please let us know. We're happy to experiment and get back to you.